His All Holiness Ecumenical Patriarch Bartholomew ascended to the Apostolic and First Throne of the Orthodox Christian World on November 2, 1991. Since becoming the Archbishop of Constantinople, New Rome and Ecumenical Patriarch, he has engaged all Orthodox Christians and the world’s diverse religious communities, policy makers and cultural leaders, with his message of peace, reconciliation, restoration, and renewed hope. As the Ecumenical Patriarch, a purely spiritual leader, he transcends national, cultural and ethnic divisions. For the world’s 250 million Orthodox Christians, he is the convener and visible sign of unity of the worldwide Orthodox Christian Church. In his role as Ecumenical Patriarch, His All Holiness Bartholomew serves as a global peacemaker and bridge builder, a tireless advocate of religious freedom and tolerance, and a champion of environmental conservation and restoration. He has worked tirelessly and courageously for the re-establishment of the Orthodox Church in Eastern Europe, torn by the religious oppression of communist and totalitarian governments. In a world where environmental exploitation and pollution have had disastrous global impact, Ecumenical Patriarch Bartholomew has been the principle religious leader of international stature to name the environment among his top priorities. He established the universal adoption of September 1st as the “Day of the Protection of the Environment” among all Orthodox Christian Churches. Most importantly, His All Holiness has focused discussions about the environment on human spirituality. He contends that restoration of the environment is only possible through the reconciliation of human beings with one another and with God. In saying that, “sin against the environment is… sin against God”, His All Holiness demonstrates simply and directly that broken relationships human beings have with one another and with their Creator are at the root of our environmental crisis. Only by restoring justice and mercy to human relationships, and uniting hearts and minds on God’s love for all aspects of His creation, can the brokenness of humanity be healed and the environmental crisis averted. In all his many environmental initiatives around the world, His All Holiness is a singular, relevant, and honest voice on our environmental, moral, and spiritual crisis. The title, “the Green Patriarch” has been worthily bestowed on him by media and leaders around the world, including former US Vice President Al Gore. As an integral part of his service to the Church and world at large, his upcoming Apostolic and Patriarchal Visit to the United States is a response to today’s global crisis and proclaims a call to balance and moderation. He will preside over the Religion, Science and the Environment Symposium (RSE) entitled Restoring Balance: The Great Mississippi River. As he has for all his decades of ministry, Ecumenical Patriarch Bartholomew, the Green Patriarch, continues to challenge the world to adopt environmental conservation as a spiritual imperative. While in the United States, His All Holiness will celebrate the tenth anniversary of His Eminence Archbishop Demetrios of America’s ministry to the Greek Orthodox Archdiocese of America, the Eparchy of the Ecumenical Patriarchate in the United States. 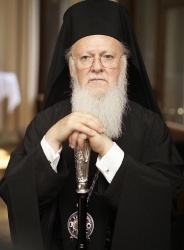 Ecumenical Patriarch Bartholomew will also make a variety of pastoral visits to churches and ecclesiastical organizations, and meet with religious and political leaders in New York and Washington, D.C (including the President, Vice President, and Secretary of State of the United States, the Speaker of the House of Representatives and the Majority Leader of the Senate, and the United Nations Secretary General), as he continues his witness to the unity of Orthodox Christians, and issues anew his call to action for religious tolerance and understanding. I think his “All Holiness” has confused pop science sociology with Apostolic principles of unity. In fact, everywhere he’s gotten involved, he has sown discord and division. If he really, truly wanted to work on unity, it would be easy to see. Met. Philip, Met. Jonah, Met. Christopher would be meeting with him – without Abp. Demetrius. Then again, sigh, I don’t expect he would even consider meeting with the real leaders of Orthodoxy in America for any reason. Do you think any of our bishops will have the courage to correct him, the way Paul corrected Peter? Nah, me neither. I prefer to assume that there will be behind the scenes meetings with leaders of the non-GOA jurisdictions in America, that the Patriarch’s “witness to the unity of Orthodox Christians” would included such interactions. Given the political sensitivities, I could see this being a good choice – even for the non-GOA leaders. I am well aware there is no reason for me to think this is taking place, just a hope putting the best construction on the situation. I have often said that most Orthodox, regardless of jurisdiction, would welcome the EP (and perhaps even its omophorion) where the EP to simply begin acting ‘ecumenically’ within Orthodoxy. If separate but equal ethnic jurisdictions under the ‘more equal than the others’ Greek Archdiocese were no longer the vision of Orthodox unity in America, I think people would welcome being under the EP (if they had to be ‘under’ any other local church) if for no other reason than because of the GOA’s being the largest and richest jurisdiction in America, to protect the Great Church and to balance the power and influence of an otherwise unfettered Moscow (which would then be far and away the single most powerful voice in Orthodoxy, which is not good for Orthodox conciliarity). Christopher, not exactly I’m following you but I agree with your 1st point wholeheartedly. I was sickened to read the self-aggrandizing bulletin insert handed out last Sunday. “But enough about me talking about me, what do you think about me?” I live here in the Bible Belt with mega-churches who have pastors who make six-figure salaries and wear Hugo Bos suits, drive BMWs, live in palatial estates, and yet I’ve never seen or heard anyone of them brag about themselves to this extent. We’re talking about heterodox preachers, some of them are just barely Trinitarian. Think about it: have you ever seen the President of the Mormon Church describe himself in such glowing terms? The Dalai Lama? A man who has truly suffered and has tremendous moral authority. Forget about the Pope –he never has. The last one who did was a Borgia and he lived 400 or so ago. I read this differently. Is it pretentious, and overbearing?…of course. Would St. John Chrysostom have stooped to this? Of course not. And is H.A.H. being well advised by his handlers? Of course not..but so what else is new? But from my vantage point, which is admittedly much different from the EP’s…I just see this as a gigantic, if not pathetic and truly pitiful attempt at reclaiming some sort of relevance. All of the folks you have mentioned, the Pope, the Russian patriarch…they all lead “live” churches. Not so here. One of the things that always fascinated me about the history of Byzantium, from the 1100’s on, was the sense that it was simply a story of one missed opportunity after another…being replayed over and over and over. The Crusades, the civil wars, the disputes with the other Balkan kingdoms, the religious bickerings, the transporting of the Turks to Europe (the Byzantines brought them there!). The very last one was when the Hungarian canon maker, Urban, came to offer his services to the emperor – FIRST..and was dismissed. He changed sides, and built the canon that brought the walls down. This is nothing but more of the same….2000 years of moral credibility squandered. Such a shame – H.A.H. would do well to take a page out of Met. Jonah’s book. You touch on something important Dean. Americans would be the first to go to the EP’s aid if we didn’t have to wade through all the presumptuous claims (and shoddy reasoning) first. All that baggage — Fr. Elpidophoros’ speech, the coddling with “Progressives,” the specious historical claims, throwing all the eggs into the global warming basket, ad infinitum (they keep coming up with more) — swallows any hope that the kind of pastoral (read moral) leadership that the Church really needs will occur. If the EP (and his advisers) grasped this, the support would be overwhelming. Sometimes I think the difficult historical circumstances of the Ecumenical Patriarchate could be redeemed by returning to the first commission of the Bishop: Preach the Gospel. He is in a perfect position to do this having been shorn of any real imperial authority. He would bear the cross of his suffering in humility and his moral authority would soar. No person has the right to impose this on another of course, and we have no right to impose it on the Ecumenical Patriarch. Still, it is, as you say, another opportunity squandered. yeah, I guess I’m reading too much into these actions. Dean, your right. The erosion of the Roman imperium led to the delusions of grandeur of the EPs. Some were good, saintly men, but mostly it was a question of not who was the greatest, but who was the least pathetic.